Hungry Nevadans need good food, and local gardeners can help. Photo by Ashley Andrews. If you grow vegetables, you have been there—those times when you have so much zucchini, you cannot keep up with eating it, shredding it, freezing it or sharing it. You have gone as far as to throw zucchinis inside vehicles whose windows were down. You may have even celebrated “Leave a Zucchini on Your Neighbor’s Porch Day” last Friday. And what about the other vegetables you have coming out of your ears? You have dried your harvest. You have canned. You have forced your friends and family to take your excess, and you have even provided them with Zucchini Cookbooks and Green Tomato Recipes available from Cooperative Extension. Then, you wonder why you work so hard in your garden if your friends, family members and neighbors do not want the fruits of your labor! We grow too much, year after year. We cannot help it, but we do not want the fruits of our labor to be left to rot on the vine or in our refrigerator crispers — wasted. As we care for our plants and their pollinators, we can carry our nurturing nature into our communities too. In the United States, most households enjoy access to fresh and healthy foods in sufficient quantities to live healthy and happy lives. But, nearly 15 percent of Americans do not. These folks experience food insecurity; their access to sufficient fresh and healthy foods is periodically interrupted by a lack of financial or other resources. In the last ten years in Nevada, the number of people facing food insecurity in their lives has risen from 9.3 percent to 16.6 percent of our population. We are now more likely than the national average to experience food insecurity. 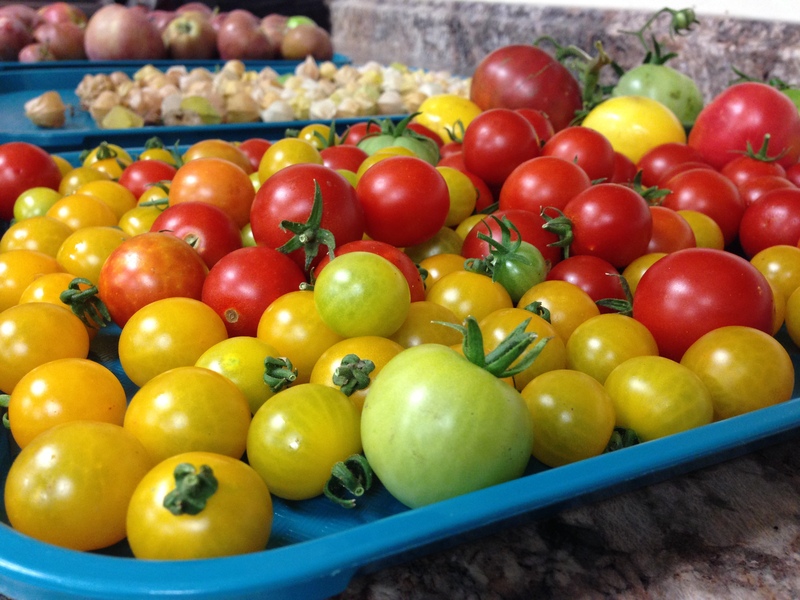 Hungry Nevadans need good food, and local gardeners can help. We can give our fellow Nevadans our safe, healthy and fresh excess zucchini and other fruits, vegetables and herbs. We can donate our harvest to food pantries, food banks and homeless shelters to feed the hungry and help local families in need. In our community, there are several organizations that nurture and help hungry people. In general, they are more than happy to receive our gardening excess. If you would like to help these agencies, consider growing and gifting to them produce that stores and transports well. Refrigerated space is limited, so foods that are safe to store at room temperature are needed. Great-to-donate vegetables include collard greens, cucumbers, garlic, green beans, hot peppers, onions, tomatoes (if picked when slightly under-ripe), winter squash (acorn or butternut) and zucchini, to name a few. Donations of fresh fruits and delicious herbs are also appreciated. Be sure to call your chosen donation location in advance and ask them if they can accept fresh produce, on which days and at which times, and if they have need for any particular foods. Try to drop off your harvest on the same day you pick it, and inspect as you pick to insure only the best quality produce is received. Insect-damaged, overly-ripe or excessively-bruised produce should not be donated. If you use pesticides in your garden, take care to read and follow the label. It is important that the correct amount of time from last use until harvest has passed. If there is any doubt, the food should be thrown out and not eaten, donated or composted. Do your best to donate only quality and safe produce, and research the protections the Bill Emerson Good Samaritan Food Donation Act provides you when you donate food to non-profits for the benefit of the needy. This year, please donate what you can to help make sure no one has to go without. And this winter, as you begin to plan next year’s garden, consider growing an extra row to donate to one of the agencies that helps families in need and feeds the hungry. Ashley Andrews is the Horticulture Assistant and Liz Morrow is a Certified Master Gardener Volunteer with University of Nevada Cooperative Extension. For plant questions, contact a Master Gardener at mastergardeners@unce.unr.edu or 775-336-0265. For information on upcoming Grow Your Own, Nevada! landscaping, lawn and garden classes, visit www.growyourownnevada.com. Where to Donate: A few local agencies excited to receive produce from home gardeners are listed below. Other agencies may also accept fresh produce donations. The Hands of Hope Food Bank and Operation Feed Back help the general public as well as current duty military, their families and veterans. They appreciate shelf-stable donations, but would much rather receive fresh fruits, vegetables and herbs. To donate, call 775-284-8878 or visit their websites: www.handsofhope.us/ and www.operationfeedback.us. The Reno Gleaning Project is available to collect and deliver home grown food to these two food banks. For information, call 775-813-6284 or visit www.facebook.com/RenoGleaning. The Reno-Sparks Gospel Mission is always willing to accept your freshly-harvested excess produce as well. Please call ahead at 775-323-5363 to insure that someone is available to accept your donation. Volunteers are also needed to serve 1,200 meals daily to local homeless men and women. Morning and evening volunteer opportunities are available. To help, contact Tammie at 775-323-0386, extension 16. More information can be found online at www.rsgm.org/volunteer-with-us/. The St. Vincent’s Dining Room would love to receive your homegrown garden produce, and they are also looking for volunteers to help out in their garden located on Valley Road in Reno. This is a great opportunity to garden if you don’t have a garden of your own. If you are interested in donating to or volunteering with the St. Vincent’s Dining Room, call 775-329-5363 or visit ccsnn.org/volunteer.html.